The Pomeranian is a dainty, adorable little dog with a typically friendly, though sometimes bossy personality. Also called a "Pom," this breed is extremely loyal to its loved ones and can be quite the guard dog despite its diminutive appearance. With proper training, the Pomeranian can make an excellent companion, though this dog is not for everyone. Families with young children may not be an ideal home for a Pom, but the breed often gets along well with older, calmer children. 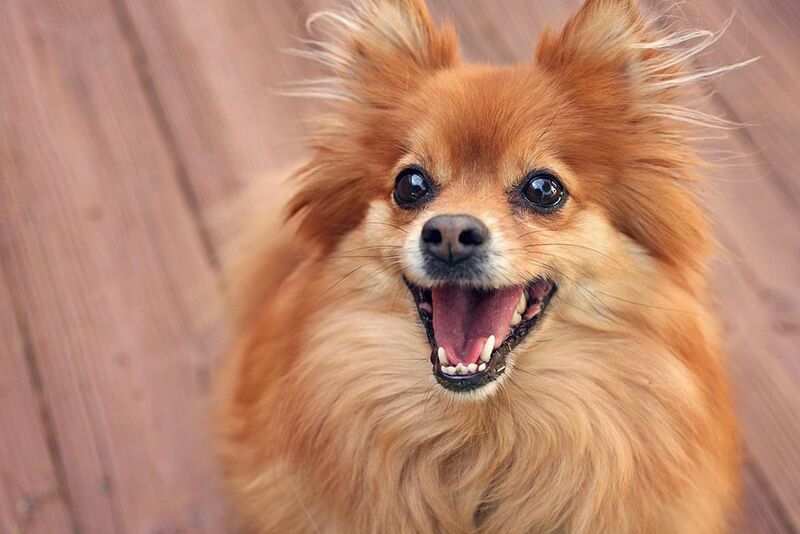 If a faithful, upbeat, small dog is what you are looking for, a Pom might be the right match for you. Coat and Color: The Pomeranian has a long double coat that comes in many colors, though the most common are red, orange, cream, sable, black, brown, and blue. The Pomeranian is a descendant of the sled dogs of Iceland and Lapland and is the smallest member of the spitz family of dogs. The tail curled over its back hearkens to its relatives, the malamute and the samoyed. The breed gets its name because it was developed in areas of Germany and Poland, which were then known as Pomerania. At that time, the breed was somewhat larger than it is today. In the late 1800s, Queen Victoria of England owned Pomeranians and allowed them to be shown in a conformation show, resulting in a growth in popularity of the breed. It is believed that this is when the Pomeranian started being bred down to a smaller size. The Pomeranian gained popularity in the United States around the turn of the 20th century and remains a popular dog breed today. They were officially recognized as a breed by the American Kennel Club in 1888. Two Pomeranians were among the three dogs that survived the sinking of the Titanic in 1912. Both escaped in lifeboats with their owners, Margaret Hays and Elizabeth Barrett Rothschild. The Pomeranian has a long, thick, double hair coat that requires somewhat frequent grooming. Plan to brush your Pom's coat out several times a week. Some Pom owners prefer to have their dogs' coats trimmed by a groomer periodically, which will reduce, but not eliminate, the need for routine brushing. Trim your dog's nails regularly, especially if you start hearing clicking on hard surfaces. Poms can have dental problems, so it is best to brush your dog's teeth regularly. Daily is good, or at least a couple of times per week. Poms also have a medium-high energy level, so routine exercise is highly recommended. Try offering daily walks and frequent play. Poms will also enjoy the chance to run around occasionally (and they don't need much space to do it). They have good endurance and you can take them on walks of over 5 miles without ending up carrying your pooch. Good leash training and management is important as Poms don't realize they are small dogs and may confront larger dogs. Because of their small size, a Pom can be injured by rough handling by a child. A Pom may not be a good fit for a family with small children until the kids are old enough to learn to handle dogs with care. Poms can be good in a multi-pet household with cats and other small dogs. However, you will need to socialize your dogs well if introducing a Pom to a household with larger dogs, or vice versa. A Pom won't back down from a fight with a larger dog and may be injured even in rough play. While Poms do fairly well in cool weather, they can overheat in hot weather. They are best as house dogs, with some access to fenced areas for play. Keep in mind that they can be preyed upon by large birds such as owls or hawks or predators such as the coyote. Poms are good for apartment living, but you also need to consider their tendency to bark. They are excellent guard dogs in that they will alert you to any nearby movement. But they have big voices for tiny dogs and this may be a nuisance. A Pomeranian may be more difficult to housebreak than some breeds. Be prepared to have puppy pads and cleaning supplies handy. The tiny Pomeranian needs only a tiny amount of food. Offer two meals a day of up to 1/4 cup of dry dog food. Your dog's needs will depend on its size, activity level, and other factors. Be sure to closely monitor your dog's weight to prevent obesity, which will shorten your dog's lifespan. Even one extra pound is significant for a Pomeranian. Discuss any diet needs with your veterinarian to get recommendations. As with any breed, if you think the Pomeranian is right for you, be sure to do plenty of research before getting one. Talk to other Pomeranian owners, reputable breeders, and rescue groups to learn more. Explore the range of dog breeds out there. With a little research, you can find the right one to bring home.